Benefits of IRNSS Desi-GPS system? Why waste money building Desi GPS? 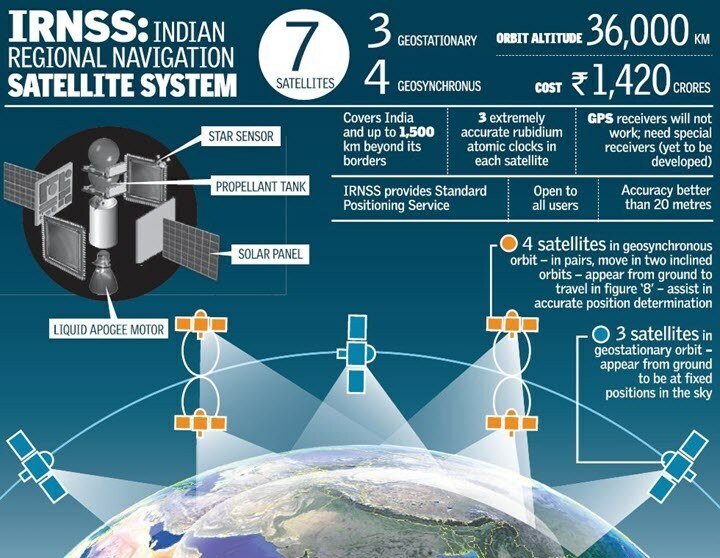 Indian Regional Navigation Satellite System (IRNSS). 2006: Government approved project with ~Rs.1500 crores. American Global positioning system has 24 orbiting satellites, a global network of ground stations. Thus GPS covers every part of the world. Therefore, our Desi GPS will use just seven satellites, and try to cover India + 1,500 km beyond its borders. HQ: ISRO Navigation Centre at Byalalu, near Bangalore. It’ll control this system. In future, we can add more satellites to increase coverage surrounding India. and with God willing, one day 25-30 satellites to cover entire earth, just like American-GPS. *PSLV: Polar Satellite Launch vehicle. (Mains-GS3) Q.Write a shortnote on the importance of IRNSS-C satellite launch 100 words. WHEN? October 2014. Hence the need for publishing this stupid article. In next two years, remaining satellites will be launch, and Desi-GPS system will become operational. (Mains-GS3) Discuss the benefits of IRNSS system 200 words. Accuracy American GPS: 15 metersOur IRNSS: 20 meters. Will serve both civil and military users. Will provide time-location coordinates on land, sea and air. Cell phone apps- for mapping, driving, hiking in jungle and remote areas. And if you use it with Idea-internet then rickshaw-walla can’t make you ‘ullu’. Forest department: Putting out wildfire, tracking endangered animals. Fleet Management e.g. taxi or truck company can monitor whether their driver is on right path or not. During war: naval fleet Management, missile navigation etc. Interview question: Why should Indian Government waste money on IRNSS? Why not simply use American GPS at a fraction of that cost? 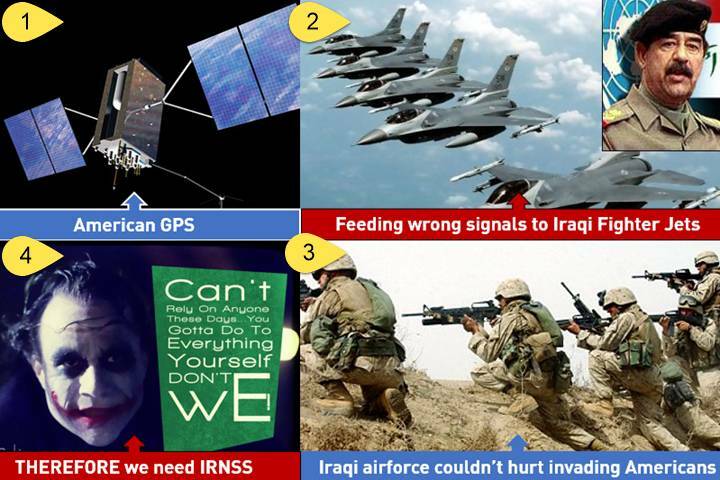 During the Iraq war, the Americans sent wrong GPS signals to the Iraqi jets and missiles, therefore Iraqis could not attack Americans forces in a precise manner. For the short term, We (India) have designed our missiles and fighter jets to can use both GPS (American) and GLONASS (Russian) signals for navigation. And if we want to attack Russia or its ally China, we can rely on American GPS. But for long term, we will need our own Desi-GPS system. Same reason why we need Anti-satellite missiles, to shoot down videsi-GPS systems during war. ‘Global Positioning System Aided Geo Augmented Navigation System (GAGAN) for civil aviation purposes. But as the name suggests “GPS aided …” meaning it is not a separate independent navigation system. It depends on GPS (American navigation system). Therefore we need IRNSS for long term solution. Since IRNSS project will still take two years to complete= Topic remains important for scientific principle MCQs in CSAT prelim 2015, 2016 and even 2017 (because even in 2017, Hindu will keep doing “mahimaa-gaan” every once in a while). So, let’s finish the scientific principle once and for all. Microwaves: how they help in GPSing? IRNSS satellites use two microwave frequency bands: L5 and S.
These microwaves travel at speed of light. Your receiver (the GPS-like gadget) will calculate the delay between microwave’s transmission and its reception = thus you get coordinates on earth. For above microwave-calculation, Navigation satellites have to periodically transmit their precise position in orbit with exact time. For this, we can’t fit Timex or Sonata watches in the satellite. They need to carry extremely accurate clocks with long shelf-life. This is an old topic from 2012. Dead horse resurrects because of IRSNSS. MCQs relevance: similarities and differences between American GPS, GLONASS and IRNSS. Glonass is Russia’s Global Navigation Satellite System. It provides location and time information anywhere in the planet. Glonass is an alternative to the U.S.-controlled Global Positioning System (GPS). 2012: Mohan-Putin signed agreement for use of GLONASS. GLONASS navigation system will allow Indian missiles, to strike within half a metre of distant targets= very accurate. GLONASS is fitted on Nuclear submarine Chakra= killer combo. iPhone 4S mobile supports both GPS and GLONASS. You can use it to know distance covered during jogging etc. Keep track of your school-buses, transport trucks etc. Can someone, Please provide me with the list of topics for “post independence part”. because reading the whole book or even a part seems to be unwise at this point of time. Thanks in advance. are some of the important topics….. Thank you Nikhil. fight against Untouchability – could you please provide a little insight about this with example. Thank you in advance. By the way, are you preparing for this year mains exam? yes me too preparing for mains…. are you from medak, Telangana??????????? I am having history as my optional…it is a part of our syllabus…. various organisations to safeguard their interest..
No. i am from Tamilnudu just little south of Pondicherry. i am having Geography as my optional. i am covering GS papers one by one and paper 2 is ending with these topics may be by tomorrow. then i am moving next GS paper. if you are quite interested in sharring information, this is my email id [email protected] and you can put it on facebook search too to get my ID. keep going – regards, Anand. I am sorry my friend, my comment is awaiting moderation which i don’t understand why. so i am texting once again. no, i am from Tamilnadu little south of Pondicherry. right now, i am covering GS 2 paper ie history,geography.. planning to finish by today. only the post independence part is left which is why i asked if i miss anything. your reply is of great value for me and a dozen thanks for that. if you wish to join further communication, this is my email id [email protected] and you can put it on facebook search too, you will exactly find me. Happy Diwali and keep studying – regards, Anand. taking attendance examiner took my signature on infront of my ticket no. sir my question is ..wil I be considered present? I am at no fault on this. I want to take loan for IAS coaching so any one know is there any scheme for tht means provide at less interest rate or any other? If have any idea then pls suggest me. mrunal sir…plz suggest the books for compulsory language paper telugu ? plz analyze ssc cgl 2014 questions held on 19 oct.
sir plzz give information about anti satellite missile.kitni countries k paas h?aur kaun si develop kar rhi h now a dayzz?? It seems Beidou doesnt have global coverage yet. Please confirm me!!!! hello sir, whatever articles you are posting, it’s absolutely brilliant but, my request is to keep a continuity up to the CS prelim exam [august 2015]. Why time is needed? The difference in time expected and arrival time tells about the elevation of place. (Microwave travels at speed of light, distance is fixed at 36,000km so difference tells elevation). GPS will even work with 3 locked satellites. Then why the hell 24? To cover entire Earth. Geostationary Orbit (GEO) If we need a satellite for the purpose which needs this satellites to remain at a particular distance from earth at all the time, then we need circular orbits so all the points on circular orbit are at equal distance from earth’s surface. its angular velocity is equal to earth’s angular velocity, the satellite is said to be moving along with the earth. This satellite would appear stationary from the earth and this orbit would be called Geostationary Orbit. There is ONLY one geostationary orbit. Geosynchronous Orbit – Sometimes we send a satellite in the space which though has a period of revolution is equal to period of rotation of earth, but its orbit is neither equatorial nor Circular. So, this satellite will finish one revolution around the earth in exactly one day i.e. 23 hours, 56 Minutes and 4.1 seconds, yet it does NOT appear stationary from the earth. The angular velocity of the satellite is equal to angular velocity of earth Period of revolution is equal to period of rotation of earth. Finish one revolution around the earth in exactly one day i.e. 23 hours, 56 Minutes and 4.1 seconds There are many geosynchronous orbits. it is practically NOT possible to achieve an absolute geostationary orbit. Advantages of GEO satellites Most communications satellites in use today for commercial purposes are placed in the geostationary orbit, because one satellite can cover almost 1/3 of Earth’s surface, offering a reach far more extensive than what any terrestrial network can achieve. The geosynchronous satellites remain stationary over the same orbital location, users can point their satellite dishes in the right direction, without costly tracking activities, making communications reliable and secure GEO satellites are proven, reliable and secure – with a lifespan of 10-15 years. GEO systems have significantly greater available bandwidth than the Low Earth Orbit -LEO and Medium Earth Orbit -MEO systems. Because of their capacity and configuration, GEOs are often more cost-effective for carrying high-volume traffic, especially over long-term contract arrangements. Disadvantages of GEO Satellites GEO systems, like all other satellite systems, require line-of-sight communication paths between terrestrial antennae and the satellites. But, because GEO systems have fewer satellites and these are in a fixed location over the Earth, the opportunities for line of sight communication are fewer than for systems in which the satellites “travel” across the sky. Polar Orbit, Sun synchronus, LEO,MEO.